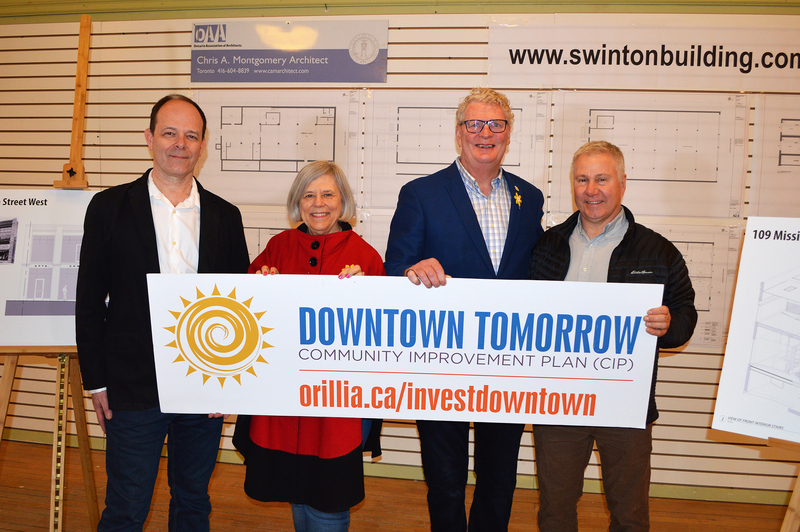 Two recipients of Orillia’s Downtown Tomorrow Community Improvement Plan (DTCIP) Grant Program revealed development plans for their upcoming projects at a grant announcement in downtown Orillia on April 16, according to a news release from the city. Mariposa Market is receiving a Building Improvement Grant of $25,000, which will allow for renovations to use the second storey above the existing Mariposa Market and Scent Shop at 109 Mississaga St. E as a new retail and restaurant space. Three grants totalling $62,500 were also awarded to Chris Montgomery, owner of 27 Mississaga St. W., to create a number of commercial and residential units. Council approved $200,000 in funding for the DTCIP Grant Program for 2019. There are three intakes throughout the year with deadlines on Feb. 28, April 30 and Oct. 31. Montgomery’s plans to create two fully accessible commercial units as well as six new residential units, five of which will be on the second storey, at 27 Mississaga St. W. The grants will also be used for improvements to the outside of the building, such as window and door replacements. In surveys completed about previous projects, about 90 per cent of applicants said the DTCIP Grant Program allowed them to complete their project earlier than expected and 44 per cent said they were able to undertake larger improvements. A total of $112,500 remains in the Residential Grant Program, Feasibility and Design Study Grant Program, and Building Improvement Grant program for 2019. For more information on the DTCIP Grant Program, or to book a mandatory pre-consultation, applicants are can contact the City of Orillia Economic Development Office at 705-325-4900, or visit the project webpage on the city website.